Mission Statement: Our Mission is to cultivate long term professional relationships with our clients through quality workmanship, outstanding customer service, sound advice, and attention to details. Capitol Pools has been in business since 1989 and have hundreds of installations to our credit. We are a full service pool company involved in all aspects of pool ownership. Our primary business is new construction, (inground swimming pools, indoor pools, exercise therapy pools, pool/spa combinations, and built in hot tubs), and service/repair/maintenance of like installations. 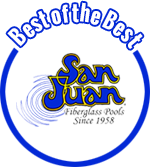 We are also a wholesale distributor for San Juan Pools offering do it yourself pool kits. Capitol Pools’ primary service area is within 50 miles of Madison WI., although new installations can be considerably farther. Capitol Pools is a Limited Liability Corporation, LLC, and is wholly owned by Tim Andrews. Tim graduated from the University of Wisconsin La Crosse, (marketing/management, 1986), managed a rental store for 3 years, then in 1989, he started Capitol Pools with another partner, then in 2002 Tim became sole owner of Capitol Pools, LLC. Tim is responsible for overseeing sales, construction, employees, and various administrative duties. Other key personnel include Tim’s wife Chris, and son Curt. Chris is involved with administrative duties, strategic planning and customer relations. Curt is the construction manager and has 8 years of pool construction experience. Capitol Pools is a member of the Association of Pool and Spa Professionals, (APSP), since 1993. APSP is the trade association for pool and spa industry which sets the standards for safety and building requirements. All of our installations meet, and in most cases exceed, construction design and safety standards. APSP is your guarantee of high quality and lasting dependability. As a member of the Wisconsin Builders Association and Madison Area Builders Association, we are dedicated to upholding the highest standards for customer service and satisfaction. As a member of the Wisconsin Better Business Bureau, we invite you to click on our BBB Accredited Business Report to view our pristine performance record.